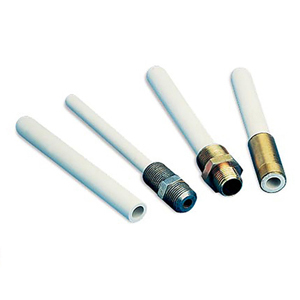 Tubes Supplied Standardly Without Fittings. Consult Sales for Optional Fittings. Model No. Model No. Inside Dia. *Length: The tube lengths shown are standard lengths for a tube without any fittings. Special lengths are also available. Consult Sales. 참고: Fittings may be ordered by contacting our sales department. When ordering tube with fitting specify the fitting number (1, 2, 3) after the model number, and add $30 to the price of the tube. 1. 1/2" x 1/2" NPT(Stainless Steel): Fits tubes from 6.0 to 12.5 mm (1/4" to 1/2") O.D. 2. 1/2" x 3/4" NPT(Carbon Steel with Black Oxide): Fits tubes from 8.0 to 19.0 mm (3/8" to 3/4") O.D. 3. 7/8" x 27NS Brass Ferrule 50 mm (2") long: Fits tubes from 17.5 mm (11/16") O.D. tubes ONLY. 118 : 1 1/8 in. 114 : 1 1/4 in.